Here we are in Week 4 of the One Room Challenge. I am feeling a bit insane. Insanely tired. Knowing what I went through last year, I am not sure why I decided to torture myself like this again. Maybe it’s a little like childbirth. In the end, it is totally worth it. Hard work and countless hours are rewarded with a beautiful room. 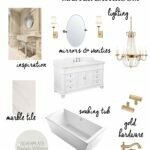 Are you new here and need an update on this crazy thing called the One Room Challenge, click here. And thankfully, the most beautiful feature in the roomwas installed this week. 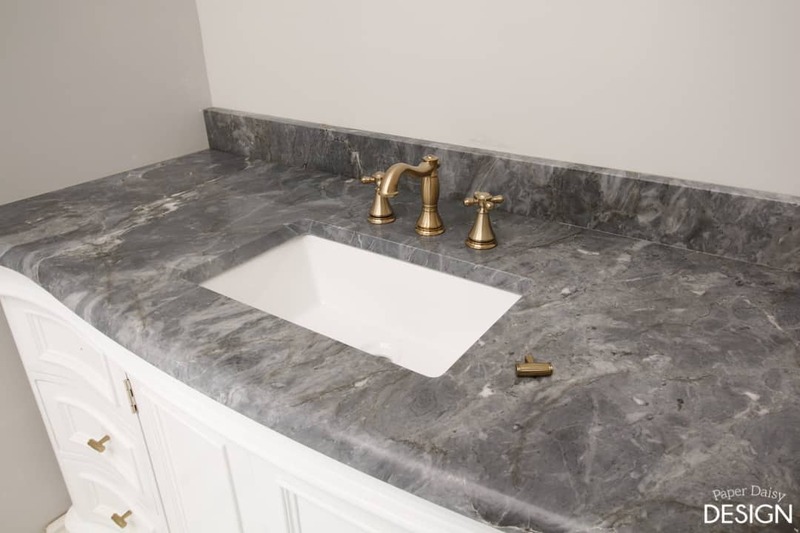 The marble counter tops. Hands down this is the best design choice I have ever made. I could just sit and stare and maybe drool over these counters. 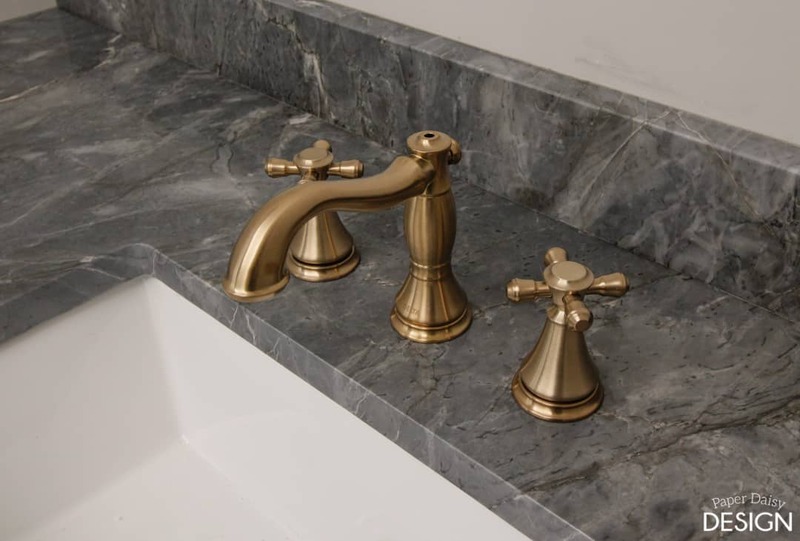 Topping it off glamourously are the Delta Cassidy Faucets in Champagne Bronze. 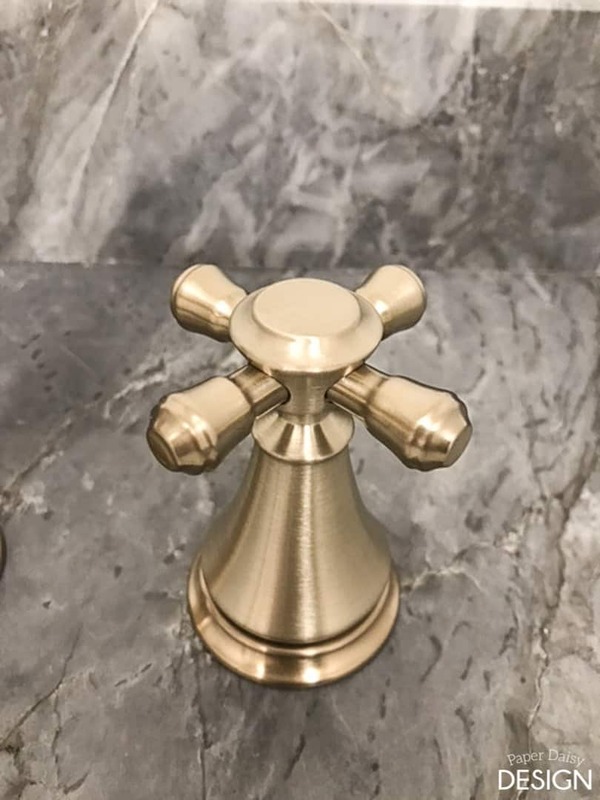 I was thrilled to find Champagne Bronze cabinet hardware from D.Lawless Hardware. They actually stock several styles of hardware to match this newer finish. It’s always amazing how just the right hardware can upgrade a piece. They still need to be installed properly. The screws were a little too long for the drawers. 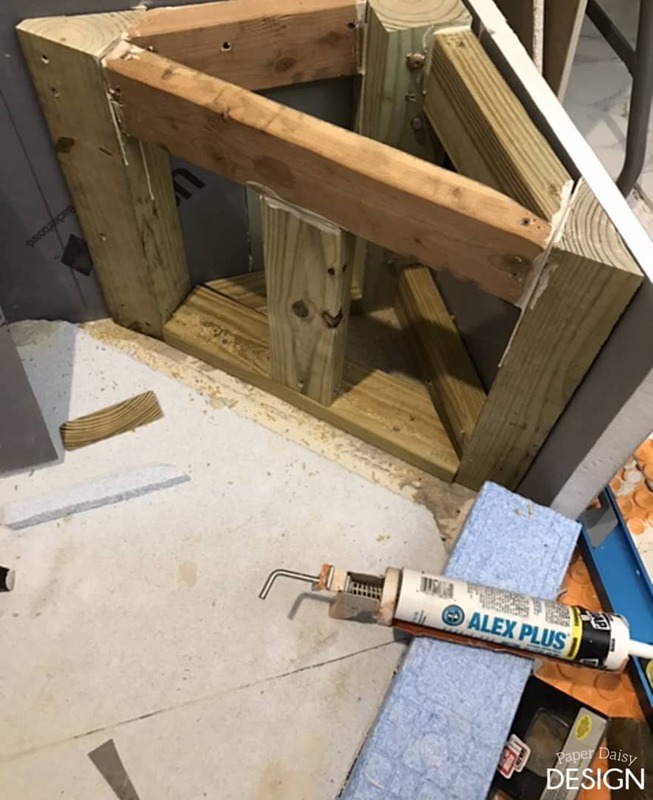 The long-suffering part of this week was the building of the shower. 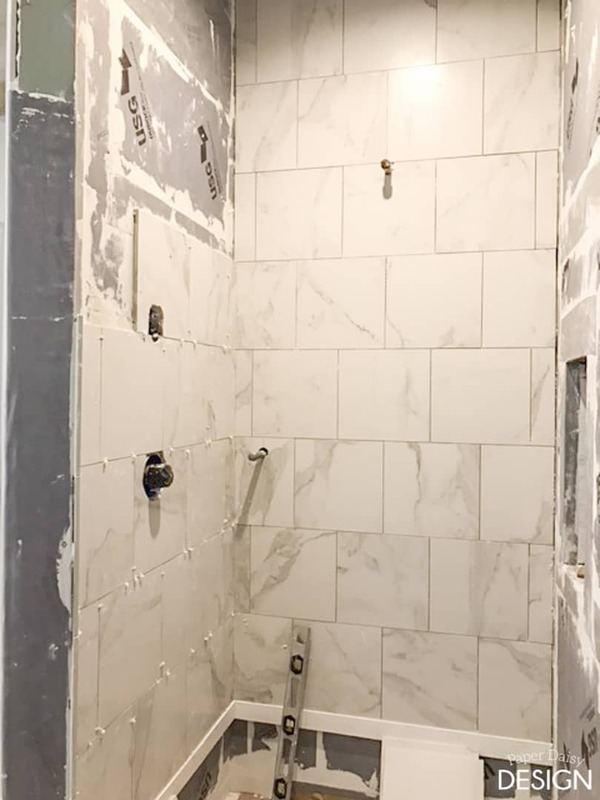 Despite having previous experience in shower construction, we found ourselves nearly doubling the time allotted for construction. 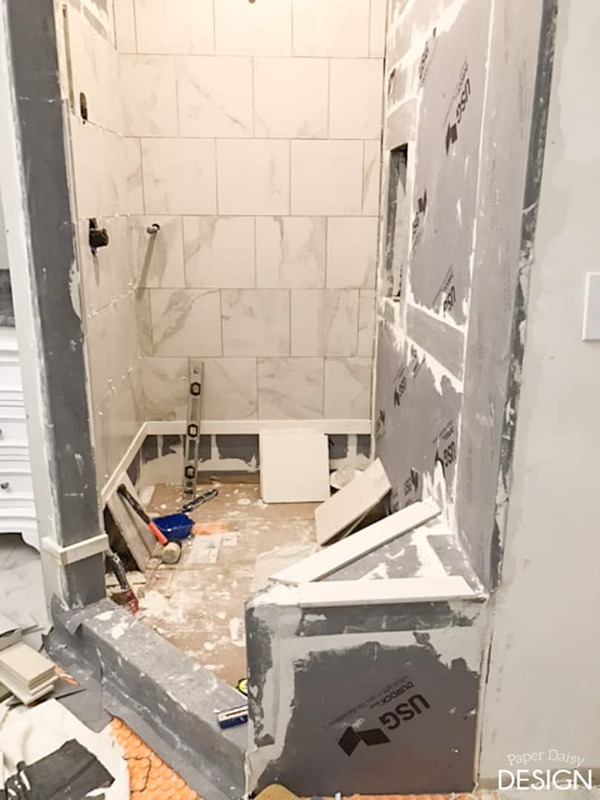 I also was frustrated that it seemed like with every turn in this shower I have been making compromises on the layout and placement of plumbing and the niche. I guess that’s just part of a renovation in an older house. You don’t always get what you want. 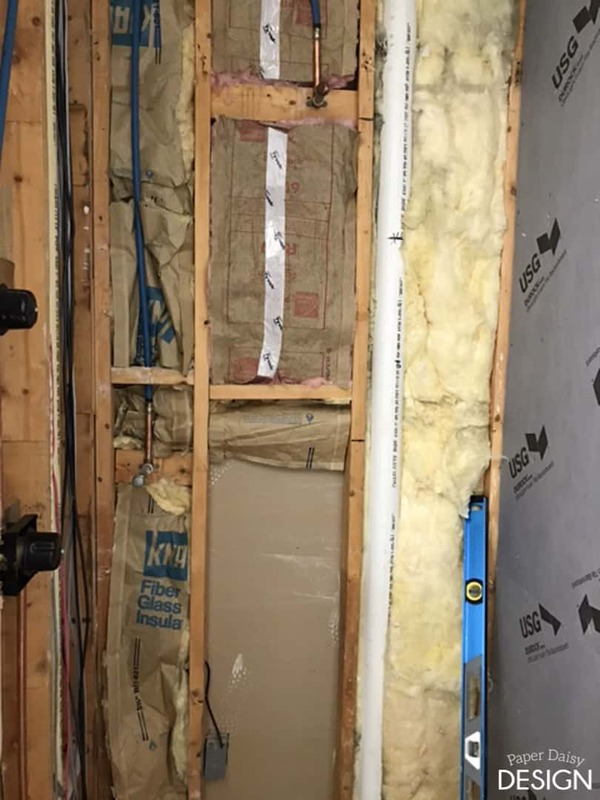 My plan was for the niche to go on the left-hand wall so that it would be completely unseen when you enter the room, but pipes were in the way. 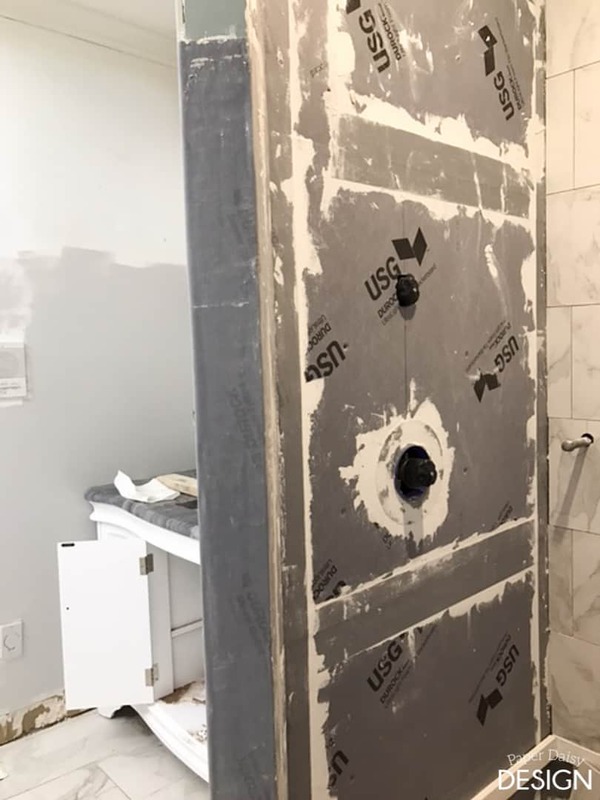 I was set to compromise and set the niche on the back wall, but the studs are not on center so the niche would be misaligned with the shower head. That would have just looked odd. So, the niche had to be placed in the very last place there was and clearly, my least preferred. It is what is and I’ll get over it. Then we moved onto building the oversized triangular bench. Can I tell you what a mathematical exercise this was? Oh, my goodness! I definitely had to do some geometry recall here. And then after we built it out of the USG foam boards, we decided to go ahead and fortify it with wood. Again a whole new geometry problem. I would be remiss if I didn’t at least mention that I am thoroughly pleased with the USG Durock Shower System. 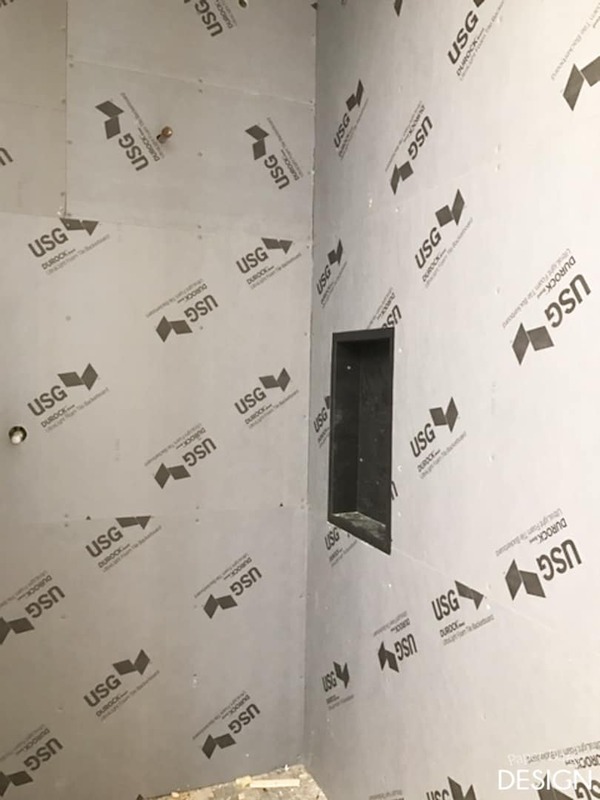 Having installed a few waterproofing shower systems by Schluter previously, I can see the advantages of the USG Durock System over the Schluter in so many ways. 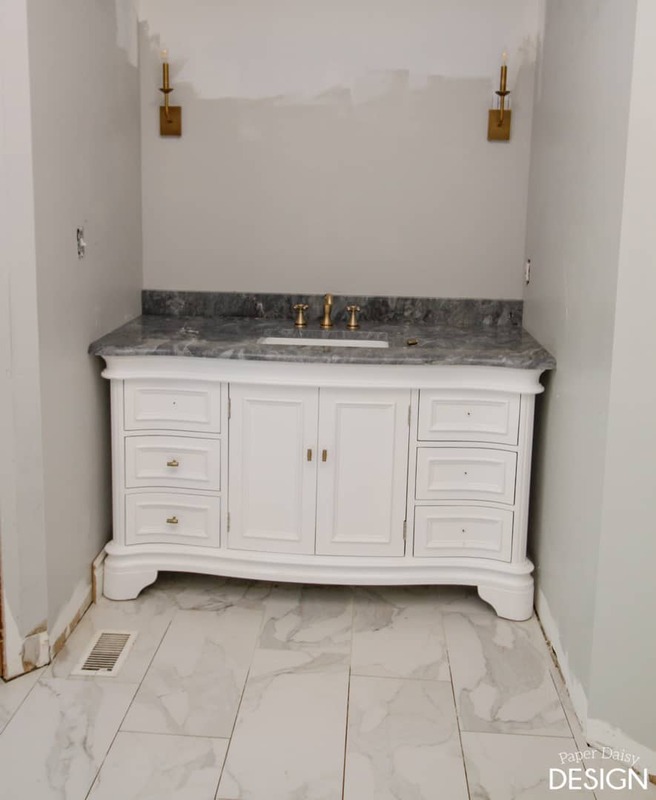 Look for a complete tutorial post once the bathroom is complete. Given these delays in the shower construction, I am way behind schedule with the actual tiling of the shower. I have had to reschedule the measure for the shower glass twice already. Honestly, I’ll be lucky to have it done before the weekend. I am resigned to the likelihood that the glass wall and door will not be in place for the reveal. 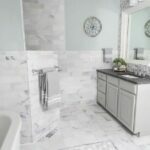 While it is an integral part of the shower, aesthetically it doesn’t add much. 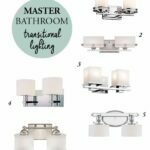 Because I realize I am behind schedule, I had a contractor give me an estimate today on installing all the gorgeous moldings and trim from Metrie. 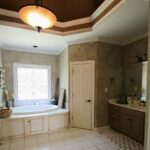 The millwork is not just a finishing detail in this room. It is an integral part of the design. Hopefully, by next week the room will look dramatically different. Oh, and I did resolve the window covering problem, at least in the short term. I’ll explain more next week. Be sure to check back on Monday, because that little secret I’ve been keeping about the space is going to get a mini-reveal!! Follow me on Facebook or Instagram to be sure you don’t miss it! 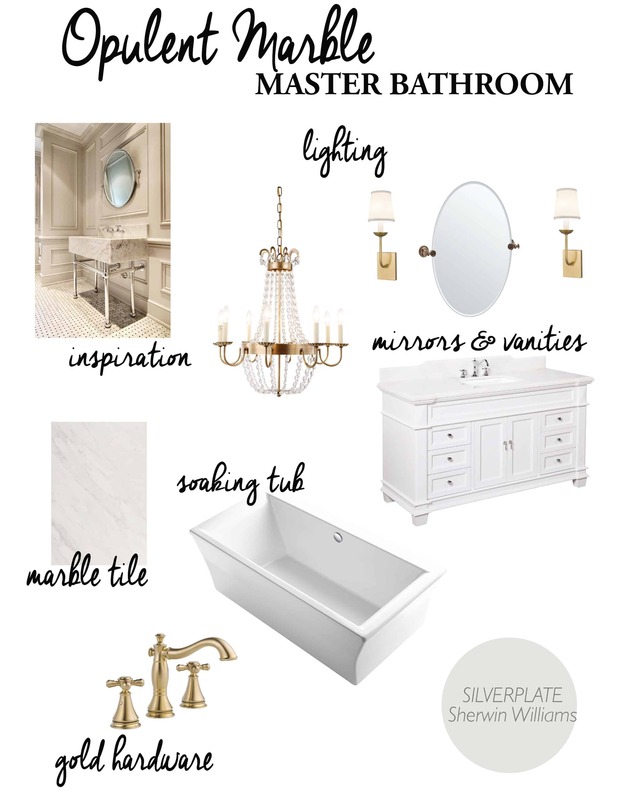 Don’t forget to check on the progress of the other bloggers participating in the One Room Challenge! Many thanks to our host Linda at Calling it Home! I am extremely grateful for the support of the two major contributors to this season’s One Room Challenge, Metrie, and South Cypress, as well as D. Lawless Hardware. 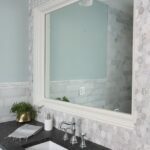 Want to see the reveal of my bathroom makeover from last year’s One Room Challenge, also a master bathroom Click here. This is going to be stunning!!!! Wow! Can’t wait to see your dramatic difference next week (fingers crossed) and reveal.